Get out of town, that is. Susan and I decided we needed some R&R and that even just a day off would be wonderful. We worked on Janet to come with us but she was just too busy. 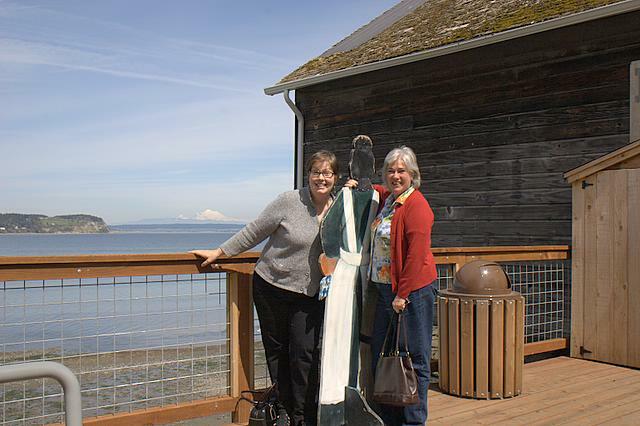 So Friday morning early, I headed up to Port Townsend to pick Susan up. We were a bit stymied though, because the ferries were cancelled because of extreme low tides. But we didn't let a minor inconvenience like that stop us. We put the car in line on the dock and wandered into town, playing tourist. We gazed in windows and ooh'd and aah'd over paintings and sculptures and spent quite a while in the kitchen store. I really do need new plates! All that developed a thirst and we went into Tyler Street Cafe for a cup of joe and a wonderful apricot cream currant scone! I'll diet next week. By this time, the tide was high enough and the ferry could run so we headed back and enjoyed a wonderful 20 minute ride across to Whidbey Island. 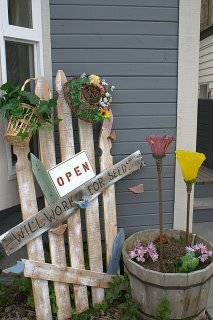 Initially, we had hoped to go to the Skagit Valley Tulip Festival but with the warm weather we have been experiencing, the bloom was almost over, so we decided to go to Coupeville instead. It's a cute little town, the mainstreet is very historic and lined with artist studios and stores and restaurants. Again, we browsed and spent considerable time laughing at some hilarious cards and trying to decide who we could send them too! Then it was time for lunch at the Knead and Feed. 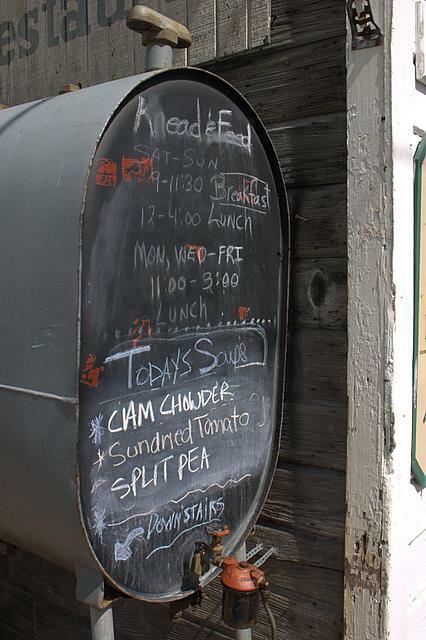 Downstairs is a tiny little restaurant that makes everything from scratch - the bread, the soup and the pies! We opted for soup and salad with a huge hunk of homemade bread and a glass of chardonnay. What a nice treat, and what a cozy little place. As it was Friday, we knew we would have to contend with ferry traffic going back to Port Townsend so we hightailed it back but ended up waiting for two and a half hours and got home around 7:30. It felt so good to get out and about and see something other than our little area. With such big geographic areas to cover, it is sometimes a bit off-putting to get out there -especially with gas prices so high! But it is well worth making the effort and we plan to do it at least a couple of times a month. And hopefully, Janet will come with us next time.